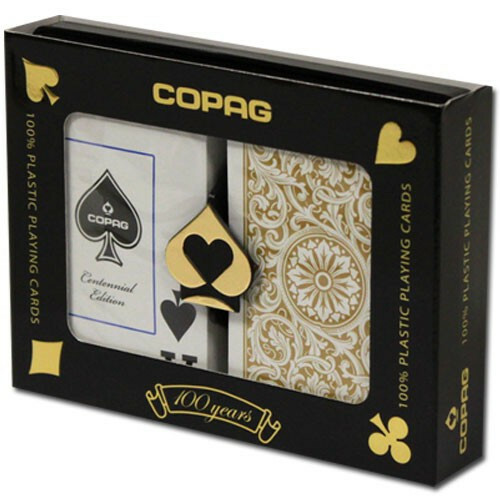 This bridge-size playing card set from COPAG comes with 2 decks of 100% plastic playing cards that will last up to 100x longer than standard paper-based playing cards. 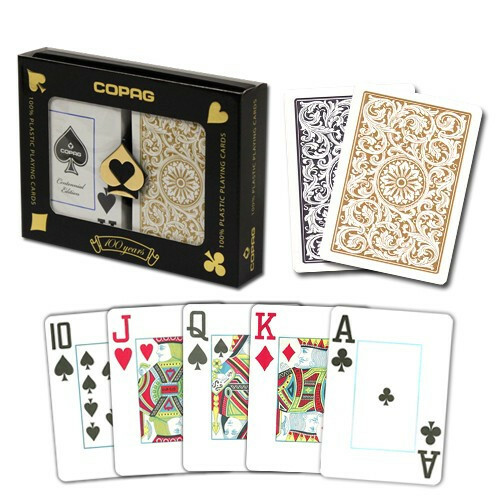 This set includes both Black and Gold decks, with jumbo index (larger numbers on the face) for easy play. 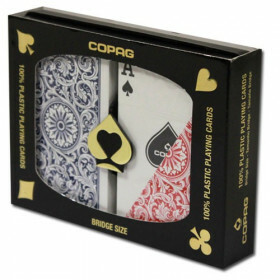 The bridge-size cards are 2.25" x 3.5" in size, and while narrower than standard poker decks you may be used to, can be used for poker as well as other games. 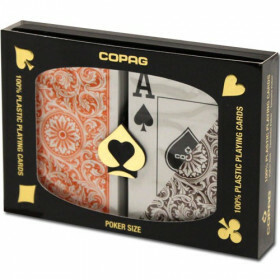 Upgrade your home poker game or local club with a set of high quality plastic playing cards from one of the world's leading manufacturers. 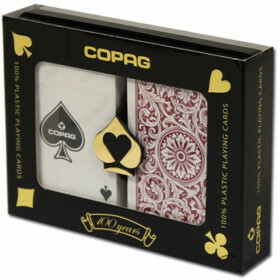 COPAG plastic playing cards are preferred by professional players, dealers, and casinos around the world for the quality construction, consistent play and legendary durability. If you play often, you know how quickly cheap cards can wear out and need to be replaced. 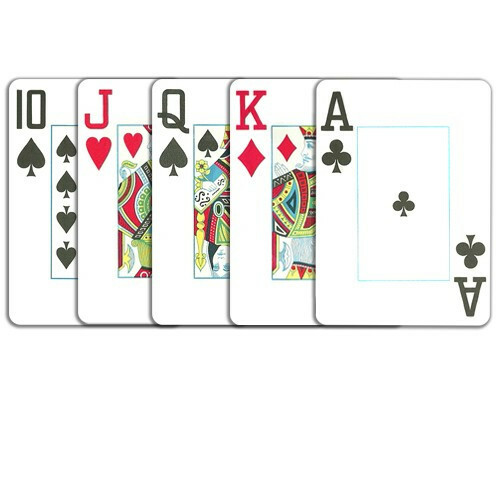 Plastic playing cards will last up to 100x longer than these cheap paper playing cards, which means your cards will always be in good shape and ready for a game. No more quick runs to the store to replace that worn out deck before the party. 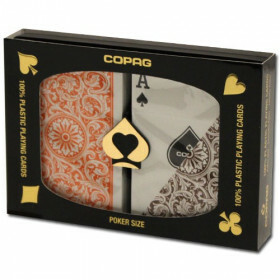 This set includes a pair of COPAG 1546 playing cards, one black deck and one gold deck. 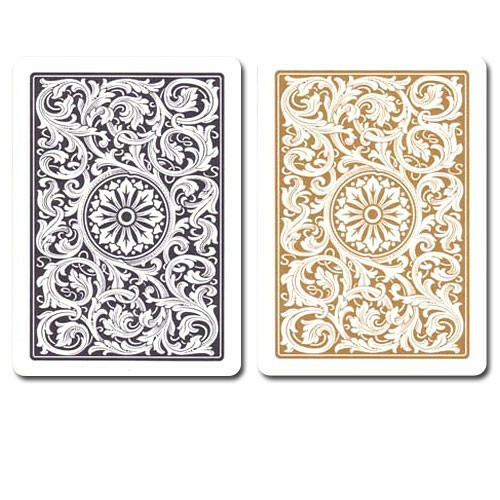 The decks are bridge-size, which means they are just slightly narrower than the standard dime store playing cards you may have been used to. That's OK, it turns out that most professional poker rooms in the country actually use bridge size playing cards for their games. 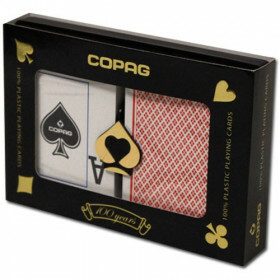 Buy a set today and have a set of high quality playing cards around for whenever a game turns up. Whether you simply have an occasional game with friends, or your club plays regularly, you will be happy you upgraded your game.